We have a great opportunity for you to be seen by College Coaches. 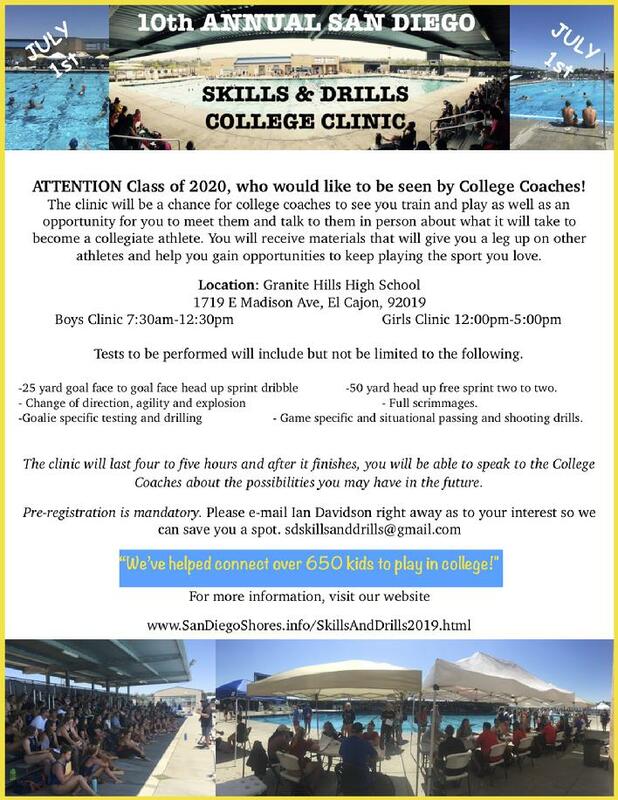 We are hosting our 10th annual Skills and Drills Clinic here in San Diego on July 1st at Granite Hills High School. The Boys will be from 7:30am-12:30pm and the girls will be showcasing their skills from 12:00pm-5:00pm on July 1st. The showcase will be a chance for college coaches to see you train and play as well as an opportunity for you to meet them and talk to them in person about what it will take to become a collegiate athlete. You will receive materials that will give you a leg up on other athletes and help you gain opportunities to keep playing the sport you love. Pre-registration is mandatory so please fill out the form below. This will be on a first come first serve basis.